Gino Vannelli is scheduled to perform at the Beverly Hills Saban Theatre on November 8. An extensive Roland V-Mixing System will be deployed to mix and record the live performance to produce a TV special that will air on PBS stations throughout the U.S. Selling more than 10 million records worldwide, Gino Vannelli is an artist for whom passion and honesty are guiding rules. Vannelli’s string of hit recordings and his renowned gifts as a vocalist, composer, and lyricist place him in a league with the great interpreters of popular songs. Vannelli has remained current with new modes of expression from piano-vocal concerts, singing with symphony orchestras to big band or pop ensembles remaining impassioned and true to his art as ever. Produced by Ross Vannelli for COA Productions, this TV special event will be used as a PBS fundraiser throughout 2014, in conjunction with Gino Vannelli concerts throughout US markets. 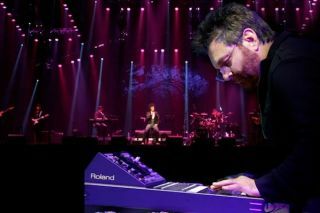 Ross Vannelli, who has mixed numerous shows and has toured extensively with the V-Mixing System, will be at FOH mixing with a Roland M-480 as well as collaborating with Nick Moon, operator of two Roland R-1000’s recorders, to capture the concert. Matt Greco, monitor engineer for this event, will be using a Roland M-380 Digital Mixing Console along with M-48 personal mixers for the backline musicians. Audio will be distributed using two S-4000 3208 digital snakes, two S-1608 digital snakes and the S-4000D REAC splitter and distribution unit for the M-48 personal mixers. Splits off of the S-4000D will be sent to two R-1000 Multi-Channel Recorders to capture all of the live audio channels.